Add 1 tablespoon of salt and the linguine, to a large pot of boiling water and cook for 7 to 10 minutes, or according to the directions on the package. Meanwhile, in another large (12-inch), heavy-bottomed pan, melt the butter and olive oil over medium-low heat. Add the garlic. Saute for 1 minute. Be careful, the garlic burns easily! Add the shrimp, 1 1/2 teaspoons of salt, and the pepper and saute until the shrimp have just turned pink, about 5 minutes, stirring often. Remove from the heat, add the parsley, lemon zest, lemon juice, lemon slices, and red pepper flakes. Toss to combine. This weekend we got together with some friends for homemade pizza and root beer floats. I was happy to take my own mini gluten free crust (Kinnikinnick) until my friend pulled from her oven the most gorgeous gluten laden crusts I've ever seen. I didn't know you could make such beautiful homemade crusts and the smell, ohhhh...it was heaven! Suddenly my gluten free crust wasn't so appealing. I came home with the need to bake something wonderful- something deliciously warm and nostalgic and that tasted like the gluten baked goods I remember. I chose one of my favorite no fail recipes - Gluten Free Loaded Pumpkin Muffins. This recipe is a conglomerate of several recipes that I tweaked to come up with these delicious pillows of pumpkin bliss. The coconut milk is the secret and I've had the best results with the Thai Kitchen brand- not lite! I like them best with chocolate chips, shredded coconut and chopped pecans, but there great on there own or with just one or two of the add ins. I think you could probably take out the xanthan gum and use all-purpose flour with great result for a gluten version. Let me know how they turn out. Preheat oven to 350 degrees F. Spray with cooking spray one 8x4 inch loaf pan or muffin tin. In a large bowl, stir together the flour, brown sugar, xanthan gum, baking soda, baking powder, salt, and pumpkin pie spice. Add the pumpkin puree, oil, eggs, coconut milk, and vanilla and mix until well blended. Fold in the shredded coconut, chopped pecans, and chocolate chips. Pour the batter into prepared pan or muffin tin. Bake for 45-55 minutes for loaf and 20-25 minutes for muffins or until a toothpick inserted in the center comes out clean. Remove from oven and cool slightly before removing from pan. Remove from muffin tin immediately. Cool completely before storing. Cover tightly and store in refrigerator up to 5 days. These freeze well. My brother was in Chicago last week for work so we drove downtown to have dinner with him. 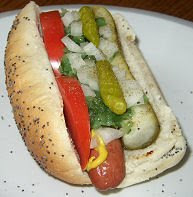 You can't come to Chicago without eating a Chicago dog so we went to Portillo's which happens to be one of our favorite eateries for Chicago style hot dogs and sandwiches. And for all you non-gluten eaters Portillo's makes a pretty decent garbage salad too. "No bread, please!" Valentine's Day was a couple of weeks ago, but I've been on a bit of a blog hiatus... I found this recipe on one of my favorite gluten free sites: http://www.glutenfreemommy.com/, and I adapted it since she used a baking mix and I didn't have one. I made my Valentine a giant heart cookie and it turned out great (although a teensy bit misshapen!) This recipe is so delicious you'll need to invite people over to share or you might end up eating them all yourself! I've already made these twice and I just picked up some sour cream to make another batch. They're good with chocolate chips too but if you don't have any add ins they're still worth making if you're looking for yummy soft sugar cookies. Since these cookies are made without eggs the dough can be eaten raw...Cookie Dough ice cream, here I come! Preheat the oven to 375 degrees. Mix butter, sour cream, granulated sugar, brown sugar, vanilla, and oil in a medium-sized bowl. Once the mixture is fluffy, add the flour, soda, salt, and guar gum a little at a time until combined. Stir in the M&Ms. Drop on greased cookie sheets in teaspoonfuls. Bake for 9-11 minutes or until slightly browned. Shane and I Love Mexican food so when I came across a recipe in Southern Living Magazine for a Mexican style roast I had to try it. The original recipe isn't gluten free and is cooked on the stove. (You can find it here)I changed it to be a gluten free crock pot meal and I also reduced the fat in the smashers. The roast is melt in your mouth tender (be sure to slice it against the grain) and the smashers are an amazing taste sensation...every bite is like a flavor symphony going on in your mouth. I'm salivating just thinking about it. I hope when you try this recipe you too feel like you're sitting down to a gourmet Mexican feast! Cook potatoes and garlic in boiling water to cover in a large saucepan until fork-tender (about 15 to 20 minutes). Drain and return to pan and cover with lid to keep warm. Whisk together sour cream, and next 5 ingredients in a medium saucepan over medium heat until butter melts and mixture is thoroughly heated. Mash potatoes slightly; add warm milk mixture to pan, and continue to mash just until blended (mixture should be coarsely mashed). Stir in chopped cilantro and corn.